There’s a certain romanticism conjured up when thinking of the Dakar Rally; driving in searing heat, windscreens smothered in dust, across inhospitable terrain in exotic locales. For us it’s Lawrence of Arabia on wheels, with the camels swapped for off-road vehicles. 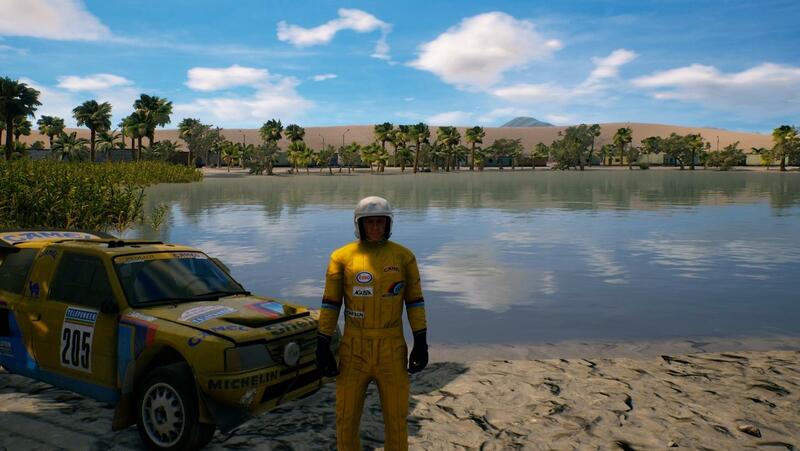 It was with a keen sense of adventure that we plunged into Dakar 18. As we had never participated in this franchise before, we took part in the tutorial, which, unfortunately, cannot be skipped. If you’ve ever sat in a lecture, where every word is flying over your head, and even the dirt under your finger nails is more entertaining, sitting through this felt exactly the same. The language used is extremely technical, and it feels that you not only should be paying attention, but also taking notes. We did neither. Then the exciting bit: driving. You’re at a start line, revving your engine, awaiting a big push off. As soon as you set off, you realise immediately from the whacky handling that this was not going to be a fun experience. You drive up a bit, left a bit, wanting to put your foot down and let rip, but you can’t. You come across a car, stuck in the mud, and you have to help them out. You have to get out of the car, hook the stuck car to your own, and pull it out. It’s at this very early stage where we became very confused. We picked up the box, just to see if we hadn’t put Roadside Assistance Simulator into the console by mistake. We hadn’t. After a lot of revving, we got the car out. And we continued, with the car literally in tow, for some time, until we couldn’t go any further. We exited the game, to try again. We were greeted with the start of the tutorial video. Again. That could not be skipped. We did exactly the same again, but were then prompted to get out of the vehicle to unhook the towed car. Our character, who clearly has special powers, magically walked through the tow rope, as if it wasn’t there. We then went on our way. When we finally crossed the finishing line, it’s doubtful we’ve ever been so grateful to bring a vehicle to a stop. And we hadn’t even started the main game yet. Putting this negative experience to one side, with renewed enthusiasm, we set about the first race in the campaign mode. For the love of God, someone please kill me, I can't get out of this game. As the game isn’t a simple racer, with a defined route from A-B, you have to follow intricate instructions. Otherwise you’re an idiot. Like us. We chose to drive a Mini and set off to the dunes ahead. For some reason, and too our astonishment, the handling of the car was 100% worse; it was like attempting to push a gym ball in a straight line in open, choppy water. We’ve never had to wrestle so viciously with a controller before, as if it wanted to take our life. We got it, driving on sand is difficult, but should it prove so difficult that there’s no actual way to drive in a straight line? After what seemed like days, we managed to get the car over the finishing line. Miraculously. It was at this extremely early point in proceedings that we decided it would be safer for everybody/thing concerned, if we step out of the vehicle and walk away from Dakar 18 forever. 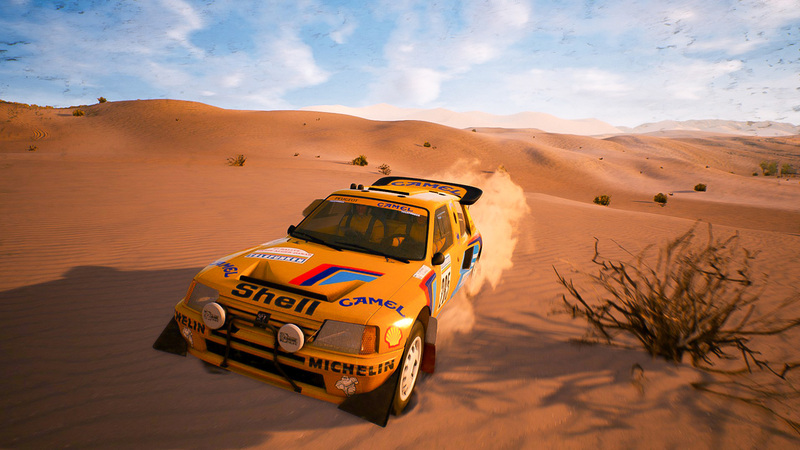 Don’t get us wrong, we love driving games; everything from Mario Kart to Forza, but Dakar 18 is a horrid driving experience, like being trapped in the backseat, being driven round the town centre by an increasingly irate parent, looking for the perfect parking space that won’t involve parallel parking, for hours. As if that wasn’t bad enough, it’s outrageously ugly. How ugly you ask? Your momma ugly. Yes, that ugly. We would say it was last gen ugly, but that would be doing a disservice to last generation technology. And don’t get us going on the physics. At one point we hit the pole of a road sign, and it broke our car. Despite the substantial weight of our vehicle, we had come across the world’s strongest pole, in the middle of the desert. We usually find something good to say about a game, regardless of our personal experience with it. But Dakar 18 has beaten us. It’s the only game in recent memory that we would run across an extremely busy road, full of cars from a Mad Max dystopian future, just to avoid ever coming into contact with it ever again. As far as this title is concerned, romance is very much dead; repeatedly reversed over by this terrible game until every ounce of fun and life left its body.